The strangest thing about the day was adjusting to fact that I was on my way to Costa Rica after four months of talking about it. My neighbor, Kathy, has the first four weeks of language school, so our husbands took us to the airport. We both had that "pinch me" feeling. Mixed emotions of wanting to do this because we'd never done it, and also because in some ways it seemed "necessary." Then the thoughts rippled through that we were "abandoning our posts" by leaving us husbands. When you step out of your comfort zone and the way things are usually done, you begin to discover a lot about who you are. Areas of your soul and unconsciousness that are not generally in your face while you're in your normal day-to-day environment. It shows you more of how you really think and believe which doesn't agree with all that you think you believe. I knew in my heart this was going to be a great thing for Randal and me, but doing it was very difficult. Some days I couldn't get beyond how strange life would be without Randal. After 30 years of marriage, and working at the same business for 20 years, we're used to having each other around. Although I'm a very independent person, with the recent years of progressing rheumatoid arthritis, I've come to depend on him being there, more than I thought I did. Not that I allow him to do much for me, but his being around certainly meant mental comfort for any unknowns that I couldn't deal with. Letting go of that safety net was a great challenge. Now ... I've launched from the shores of the known to the unknown and God has me exactly where He wants me. Having to trust and depend on only Him. I have to smile as I see Him smiling at me through this experience. It reminds me of a toddler learning to walk. He's been there saying, "Come on! Take that step! You can do it! Keep on walking! Come on! You did it!" In many ways like Peter, I've been saying "bidst me come unto you, Master" and now God's taking me up on that desire. Like Peter, I have been filled with much faith in the asking, but as I stepped into the turbulent waters and made the commitment for nine weeks in Costa Rica, I've felt as though I would surely sink as I began to realize the challenges this trip would bring. God has kept me afloat and now I've arrived. My homestay family is lovely! Very kind and gracious. 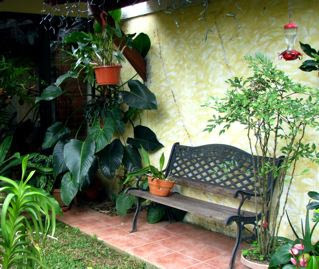 My favorite place in the house is the garden courtyard out back (shown in the photo above). There are flowers, orange and lemon trees and birds. There are various areas to sit. It's an oasis from the city that is outside the walls that enclose it. View my room and garden of my homestay family.